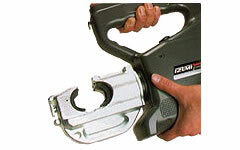 REC-3430 Battery Operated Tools: Izumi Products. 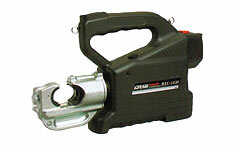 The REC-3430 is the battery operated 12 ton tool to accommodate 12 ton shell type dies widely used in the industry. Portability and handling a improved and it now features a new, larger handle opening with a rocker type advance/retract switch located on the top of the handle for one fingered operation, the handle opening and rocker switch are large enough for gloved hands. It also incorporates a built in foot base with finger indents for easier handling when holding the tool with both hands. The number of crimps per charge for maximum conductor : 37 crimps/BP70-E. This tool is designed to accommodate shell type dies for applying compression fittings to copper, aluminium and ACSR conductors.